So, I've really been MIA the last 10 days or so. What's going on around here? The sickies. Like bad. I'm talking we've gone from the stomach virus to the flu and back to the stomach virus. Its been horrible. So, I really haven't had anything to blog about unless you want to hear about the mounds of laundry I've been doing or how many cans of Lysol I've used. Probably not. 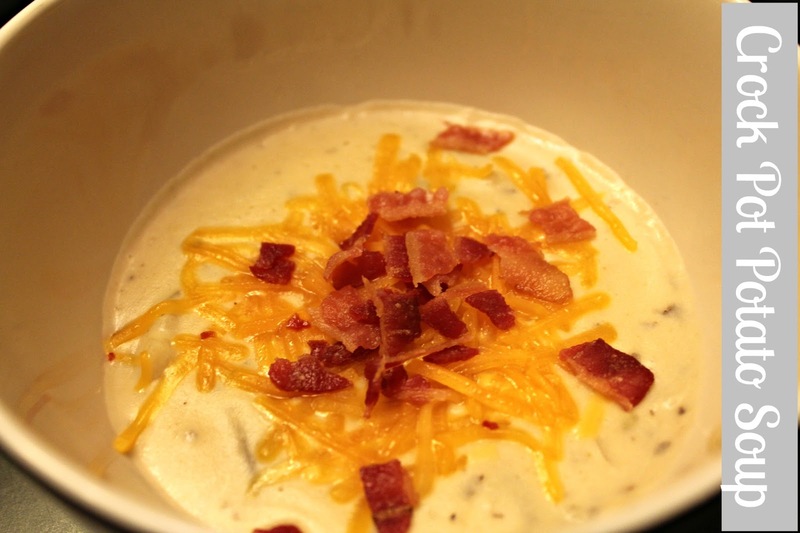 One of the meals we have eaten this week is this WONDERFUL Crock Pot Potato Soup. With the weather being so nasty, it was perfect for a cold rainy night. This is seriously the best Potato Soup I have ever had and I am quite the Potato Soup connoisseur. It is one of my favorite soups of all time. For an ongoing list of Make Ahead Meals visit my 30 Days of Baby link. Add potatoes, onion, garlic and chicken broth to crock pot. Cook for 6 hours or until potatoes are tender. Remove half of the soup. (I fill two blenders full) Blend with the cream cheese and return to pot. This meal is great frozen too. This makes a double recipe although we never have left overs. Simply freeze in a freezer bag once cooked and cooled, then thaw and reheat in the crock pot or stove top. Sorry everyone has the sickies! ~~ The soup looks delicious! I have this one pinned and will have to try it now! I love potato soup and I love my crock pot, so it sounds like a winner! Hope yall feel better soon! This looks awesome. This soup looks really good! Sorry to hear you were all sick. My kids were sick all last week with the flu. It was ROUGH, especially when I had it, too!